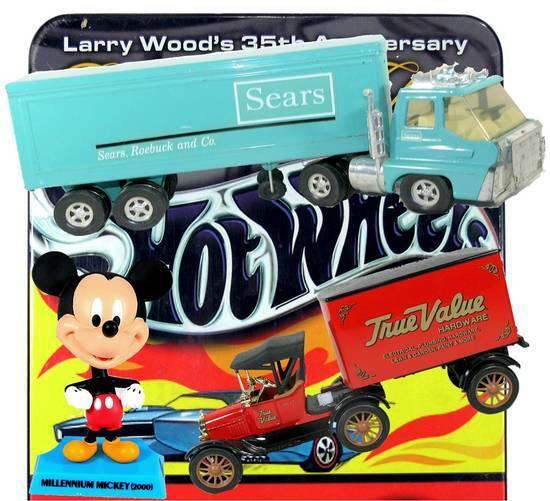 Many Collectible Toys Including Several Diecast Replicas. Matchbox, Hot Wheels and Comic Books. Mickey Mouse and other Disney Bobble Heads. Miscellaneous Antique Toys, Games, Boats and Semi Trucks. Payment Instructions: PAYMENT INSTRUCTIONS: We accept Paypal, Visa, MasterCard, Discover, Bank Cashiers Check, Post Office Money Order. To Make other Payment arrangements or to be accepted to bid, Please call Ed at 608-797-5086 A 15 online buyer's premium will be added to all sales conducted via Proxibid. WISCONSIN RESIDENTS PAY 5.5% SALES TAX. You will be notified at the end of Auction via email with your items purchased. We will Calculate Shipping Costs For all winning bidders Shipments and then Automatically charge everyone's credit card on file with Proxibid for the total invoice. If you want to use an other method of payment please contact us ASAP. Paypal users please contact us so we can calculate your shipping charge right away, otherwise you will have to use Paypal twice. Once for Invoice & Once for Shipping. If you Have any questions Please call Ed at 608-797-5086 or us email. Shipping Instructions: SHIPPING INSTRUCTIONS: Any item purchased online will be shipped thru The United States Post Office and UPS with Insurance. We will work to get the cheapest rate for you depending on the items that you purchase and what best fits your Package so that it arrives to You safely. The Shipping Costs reflect the weight of the package, the distance that they are shipped, and the cost of insurance. YOU WILL ONLY BE CHARGED FOR THE POSTAGE and INSURANCE BY THE US POSTAGE SERVICE OR UPS, THERE WILL NOT BE ANY HANDLING OR OTHER SHIPPING FEES UNLESS OTHERWISE STATED IN THE LOT DESCRIPTION!! All Items will be automatically shipped Unless otherwise Stated in The Lot Description. We Sort & pack everyone's items for Shipping The Morning after The Sale, If You want To Pickup Your Items Please contact Ed at 608-797-5086 (or email) before or at that time. Our Goal is to Ship your everyone's items 3-4 days after the sale. Preview Date & Times: Please contact the auction house for checkout dates & times. Checkout Date & Times: Please contact the auction house for checkout dates and times. Driving Directions: 6902 Icon Ave Sparta, WI. 54656 Please contact us for directions if you are going to pickup your items. Call Ed at 608-797-5086 or email. TERMS AND CONDITIONS: Every effort has been made to represent the sale items accurately thru photos and descriptions to determine condition, age, genuineness, value or any other determinate factors. Please Study the photos closely and read the descriptions thoroughly. We Understand and Acknowledge that you may not be able to inspect an item as well as if you examined it in person. We try to find and announce any problems with any lot that is to be auctioned but realize somethings can be overlooked. Please call Ed at 608-797-5086 with any questions about any lot no matter how small or unimportant that question may seem, to help you determine if this lot is for you. We want you to be happy with your purchases and for this to be an enjoyable experience for you, and for us, and to that end we will be Happy to help resolve any issues or reasonable requests about any Lot Before and After Purchasing. Please contact Ed at 608-797-5086 immediately after receiving any item that the you have an Issue with so we can resolve any problems. PLEASE NOTE ABOUT CONDITIONS: Conditions on any item in this auction, are the Opinion of the Owner of this Collection. With our help a Grade Range is Given to use as a g...moreuide to get some estimate of Value. While we feel that the conditions are Close, there is no Guarantee that is what any Grading Company or another persons opinion will give it. Please use your own Judgement and review the photos carefully as they are Part of The Description. Please contact us if you have any question on condition. We want you to be happy with your purchase and resolve any Issues before or after the auction. PLEASE NOTE ABOUT PAYMENT: We Like to Ship Quickly and will automatically use the Credit Card that you have registered with Proxibid after Everyones Shipping is Calculate...mored. If you want to Use another Credit Card or pay with Paypal please contact us ASAP after the auction before we charge your Credit Card on File with Proxibid. If You want to use Paypal Contact us ASAP so we can get your shipping calculated and send you an Invoice thru Paypal. Your First Invoice is Just a Notification and does not have shipping charges added. PLEASE NOTE ABOUT SHIPPING COSTS: 1). We automatically ship all lots unless you notifiy us for pickup. 2). We ship everything From our shop 3). No Handling Fees-You O...morenly Pay Actual Postage & Insurance unless stated otherwise in the Lot Description. 4). Costs reflect the weight, distance and insurance with USPS or UPS. 5). Sorting & Packaging Begins The Morning after The Sale. All Bidders Winnings are Packaged First, Then Postage is Calculated for all Packages, Then Payment is Completed for all Invoices. 6). We Normally Ship The Whole Group of Packages at the same time and as Quickly as Possible, usually on or before Thursday Following a Sunday Auction.